On his morning walks with God through 25 acres of woods at Dunrovin Christian Brothers Retreat Center where he lives and works, Jerome Meeds finds ideas that have made a difference at the Stillwater-area center. In his nearly 16 years as Dunrovin’s first lay executive director, Meeds has found inspiration to refocus the 50-year-old center’s mission of bringing youth to Christ while he, his staff and volunteers expand its offerings in new ways for 21st century youth. Dunrovin is a ministry of the De La Salle Christian Brothers of the Midwest District. The Christian Brothers are a Catholic teaching order that was founded in France to teach poor children. While Meeds’ and his family’s witness of their Catholic faith and dedication to the Dunrovin mission have been a constant, they have continued to innovate and adapt to a changing retreat landscape. Dunrovin’s emphasis is on youth programs, but it also rents its space to adult groups. Meeds’ own conversion as a high school junior in the late 1970s led him to a career in youth ministry. 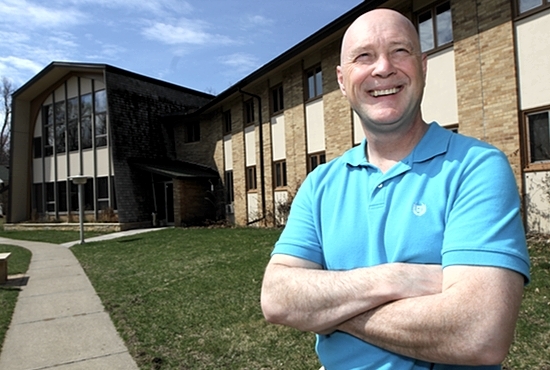 He served on West St. Paul-based NET Ministries and in other youth ministry roles before working for 12 years as director of Catholic Youth Camp near McGregor. As the first non-Christian Brother to direct Dunrovin, Meeds has sought to carry on the order’s 300-year Lasallian tradition, including prayer and service. “The transition from brothers to lay person was seamless, and it’s continued to grow and change and meet the needs of the current times,” said Christian Brother Bill Clarey, who served as Dunrovin’s executive director from 1966-1969. Meeds, Mary and their four children have done everything from camp cleanup to writing grants to serving as camp counselors, said his daughter, Christine, a senior at St. Mary’s University of Minnesota in Winona. While occasionally there were challenges, such as when Meeds’ roles as father and boss overlapped, overall, there were few issues over integrating work and life, she said. “For him, the work is more of a vocation,” Christine said. Soon after Meeds became director, the Christian Brothers began inviting Chicago middle school children — many of them underserved — to Dunrovin. These students, as well as others from the Twin Cities, continue to attend Dunrovin summer camps. At the time, Dunrovin rented its space for many adult retreats. And for more than 20 years, Franzen’s youth retreats at the center have drawn young people from metro-area parishes. Meeds realized the center needed a new way to reach young people. He wanted to serve fewer kids in order to give them more attention to help them encounter Christ as he had in high school. Seven summers ago, staff changes forced him back into running the ministry. Through his morning walks and other sources, he was inspired to develop a youth leadership program he hoped his own kids would get involved in. Applying his skills as a life coach, he and Christine developed the Dunrovin Leadership Institute Training Experience (DLITE) summer program that teaches youth leadership and service skills while stretching them physically, emotionally, mentally and spiritually. DLITE has continued in the summer, and another program called LEAD (Leadership Experience At Dunrovin) now trains 60 kids during the school year, sharing the goal of equipping young people to be leaders in the Church, he said. In the last year, Dunrovin hired a business administrator, which has given Meeds more time for youth programs and something he considers his No. 1 challenge: fundraising. He sees himself as a conduit between younger and older generations, and enjoys sharing stories with benefactors about young people. “It’s a wonderful gift to be able to be in a place where I can actually work with young people,” he said. As he continues as executive director, Meeds is seeking ways to increase Dunrovin’s service to youth and make it more youth friendly. That might mean adding facilities, but the priority is serving kids, he said.